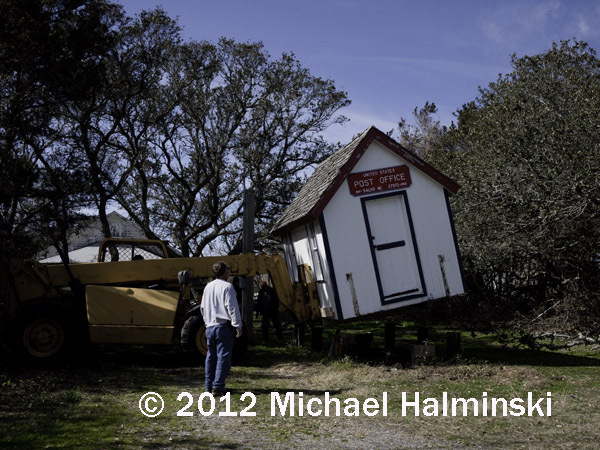 Among the many changes that our area has undergone recently, one was the relocation of the historic Salvo Post Office. 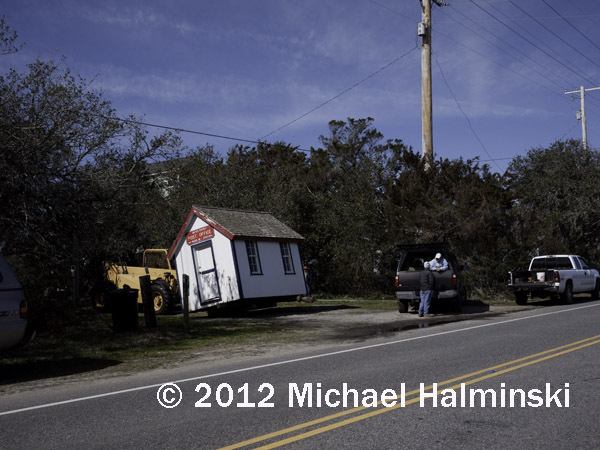 When I first moved here, it was all the way on the south edge of town, in front of Melvina Whidbee’s house. 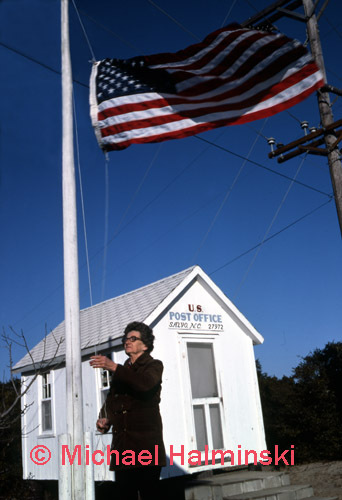 In this 1975 photo, Miss Melvina raises the colors for another day of work. 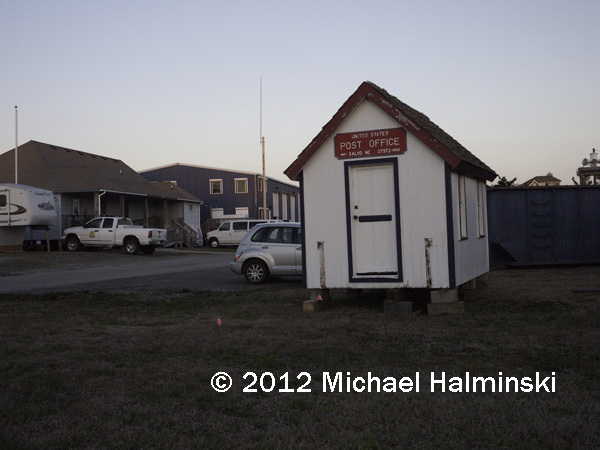 Built in 1910, it was always moved to where the postmaster lived. 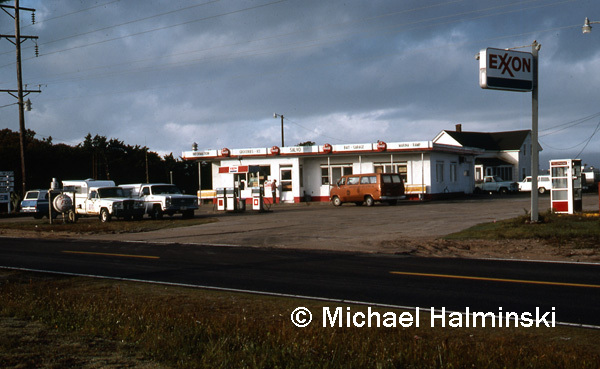 It’s my understanding that it was originally located near where Dan Leary’s store stood, shown in this 1977 photo. 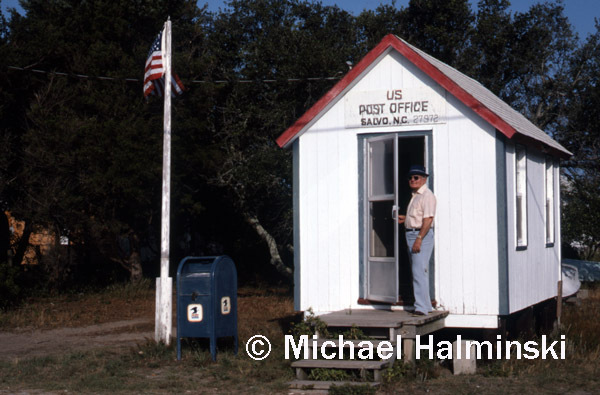 When Edward Hooper became the postmaster in 1979, it was moved in front of his home. Edward and his younger brother William, had to leave their home of many decades. 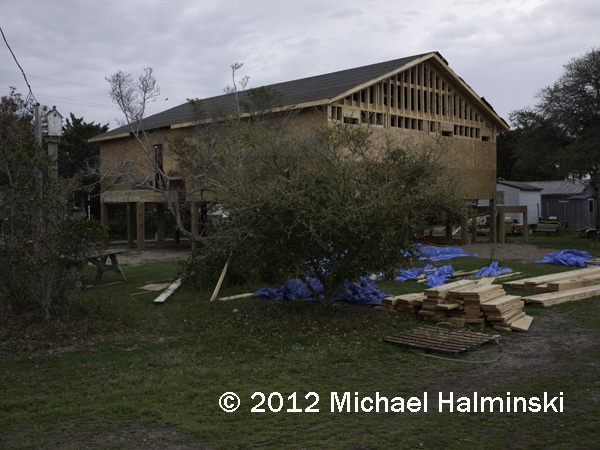 The flooding from hurricane Irene inundated it, making it uninhabitable. It is ruined. 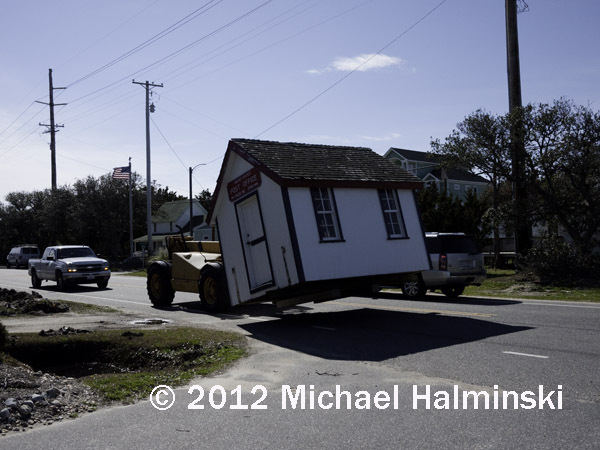 They are now both living in a home in Nags Head. The Hooper home now sits vacant and crumbling. 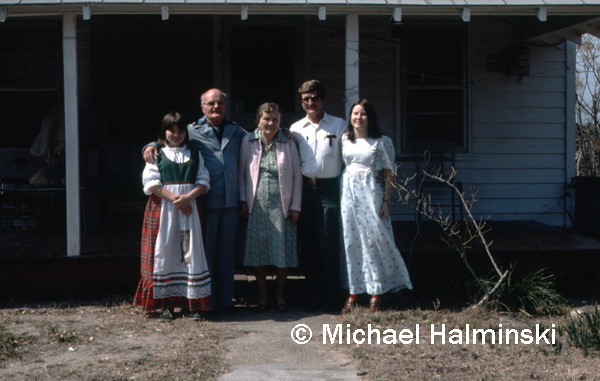 On a beautiful day in 1978, I took this family portrait in front of the Hooper’s. Edward and William stand beside their mother Mariah, flanked by neighboring nieces. 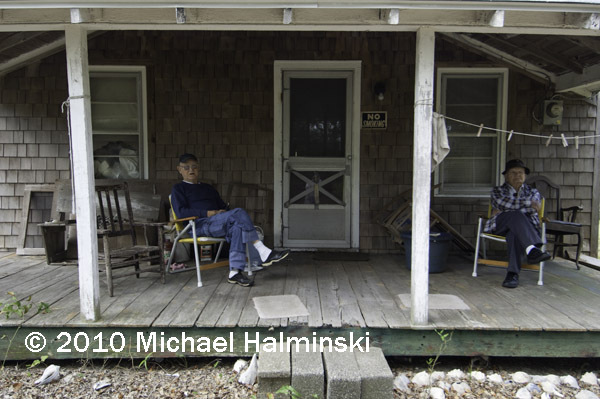 Around Thanksgiving of 2010, I shot this picture of William and Edward relaxing on the porch. I had just fixed a broken window pane in their kitchen that was letting the weather in. It was a very pleasant visit with them. 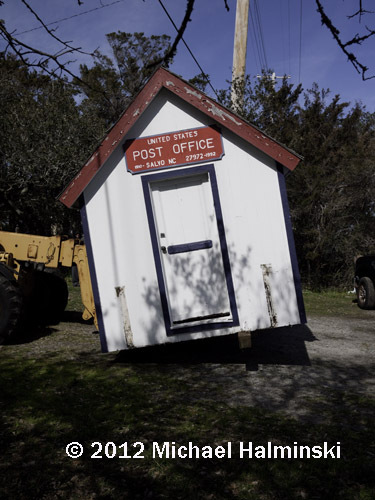 Last month some volunteers moved the tiny post office from Edward’s up to the Salvo Fire Department. It will be fixed and maintained to save it. 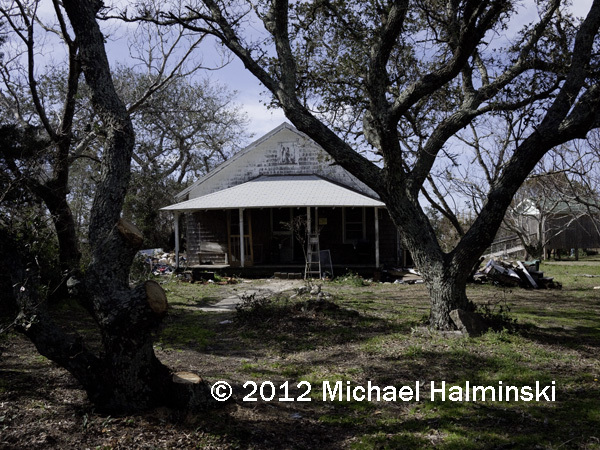 The fate of the Hooper property is uncertain, but I can visualize the old house razed and replaced by a McMansion. 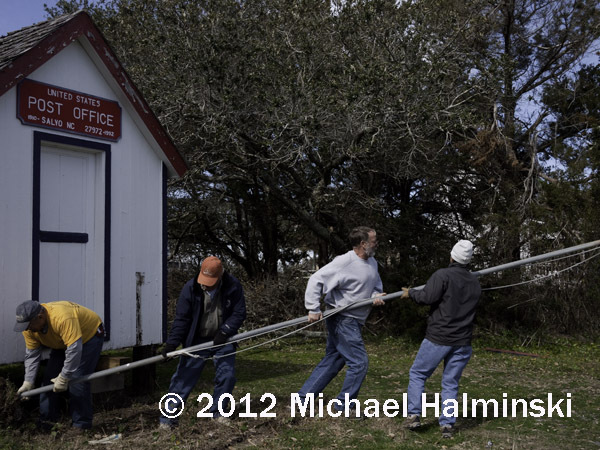 Workers remove the flagpole to prepare for the move. Bill Barley’s forklift expertise is a key ingredient for the transition. Jimmie Hooper stands by. This was a rare, once in a lifetime experience. Steve Ryan lends a helping hand. 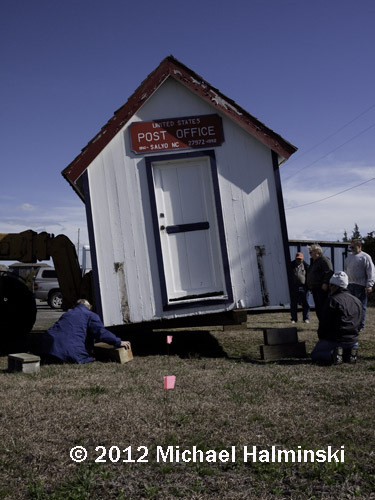 Once officially deemed the second smallest post office in the country, the building settles into it’s new location. 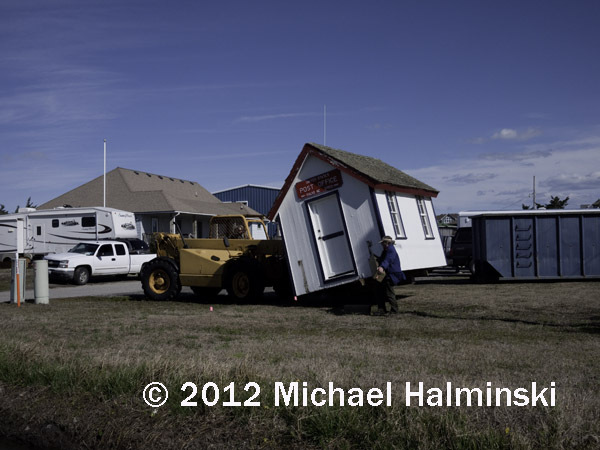 In the meantime, Miss Elsie’s new house is well underway. It will be a solid structure to resist future storms. 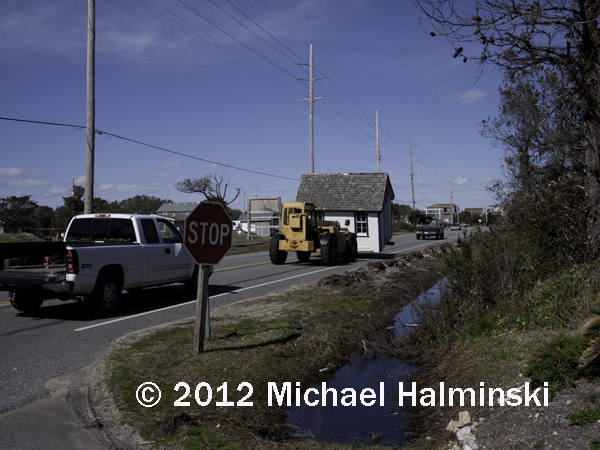 This entry was posted in buildings, Outer Banks, People on March 27, 2012 by j0jgvm89bj.